Ergo insulated heavy duty rear trigger . Metal mid size die cast zinc body. Threaded front with protected cover. Designed to tackle demanding, dirty jobs, this cleaning nozzle is easy to operate and built to withstand professional use, year after year. The nozzle head has been refined. Now you only need one turn to go from rinse to jet so there's no more endless twisting to get the flow you want. The optimized location of controls means there's no straining to reach and make adjustments. The redesigned handle features structured contours to ensure that the nozzle fits snugly in your hand for greater comfort and control. Classic rear-trigger design is easy to use and includes a conveniently located lock so you've got continuous flow during extended use. Designed to tackle the most demanding jobs, this utility nozzle is easy to operate and built to withstand professional use, year after year. The nozzle head has been refined to three essential settings so the pattern you need for the job at hand is easy to find and actuate. The optimized location of controls means there's no straining to reach and make adjustments. The nozzle is sized to fit comfortably in your hand while the thumb-trigger design offers a complete range from off to on, so you can easily set your flow and get working. 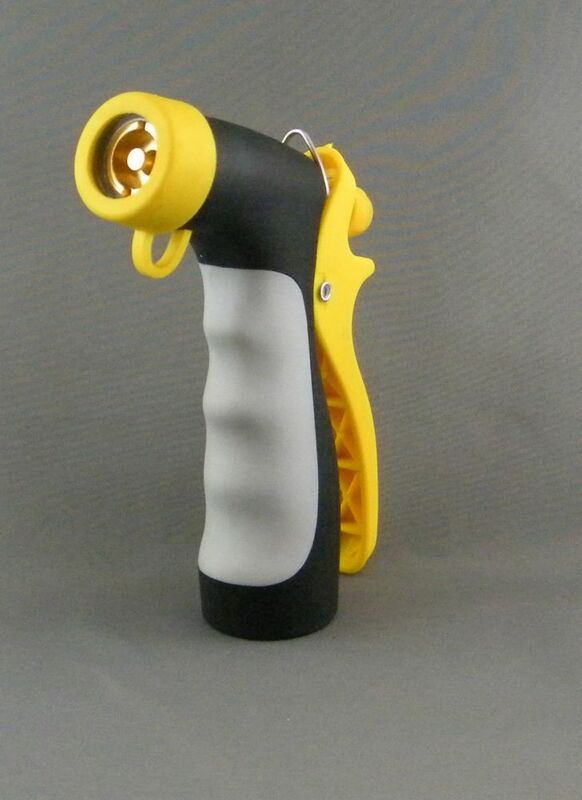 Keep your garden watered and outdoor space clean with a front trigger 7-Pattern Nozzle. The one-click trigger lock and thumb activated flow-control allow for easy one-handed operation. Adjust between 7 spray patterns from a shower for watering newly planted flowers to a powerful jet for cleaning off the deck. This durable metal nozzle is built to last season after season. Ergo Heavy Duty Nozzle Ergo insulated heavy duty rear trigger . Metal mid size die cast zinc body. Threaded front with protected cover.